UPDATE Oct. 1 – Crews finished repairing the pipeline break. Drinking water is again available at Cottonwood Campground and Manzanita Rest Area (formerly Pumphouse Residence) on the North Kaibab Trail. GRAND CANYON, Ariz. — Water utility staff at Grand Canyon National Park began repairs Tuesday for a break in the Trans-canyon Pipeline north of Phantom Ranch on the North Kaibab Trail in an area known as “The Box.” This is the second break in the Phantom Ranch area in September. Breaks are fairly common, Emily Davis, Grand Canyon National Park spokeswoman, said, with the last couple of years averaging 12 to 20 breaks a year. The pipeline was built in 1966 and 1967, Davis said. After almost 50 years of use, the aluminum pipe is starting to wear out. According to a press release issued by the park’s public affairs department, because these breaks are common, the National Park Service is usually able to maintain operations without significant disruptions to visitors. 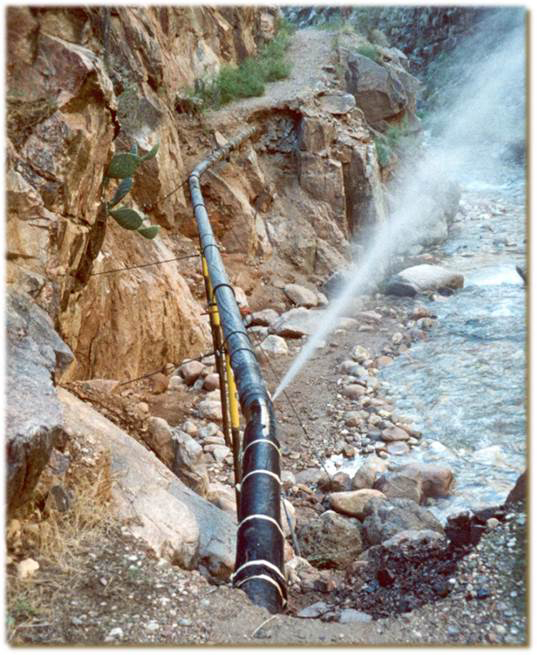 Though it is less costly to repair the pipeline, rather than replace it, the NPS is currently replacing a half-mile section just north of Phantom Ranch. The replacement, Davis said, should be done some time this year. To make the break repairs, crews will shut water off at Roaring Springs. Cottonwood Campground and Manzanita Rest Area (formerly Roaring Springs Residence) on the North Kaibab Trail will not have potable water until the repairs are complete, according to the press release. Phantom Ranch will utilize water storage tanks and will have drinking water available. All Grand Canyon National Park trails remain open. As always, the National Park Service reminds hikers to be self-sufficient, to be prepared, carry all water or have a way to treat creek water and Hike Smart. Hikers may contact the park’s Backcountry Information Center at 928-638-7875 for more information and updates on pipeline repairs. Trans Alaska Oil Pipeline as an accompanying image? Yes, somehow we chose a pipeline, any pipeline. I will be swapping out that image today that is more suitable. Nice photo of the Alaska oil pipeline. Pesky moles I tell you. Can you imagine the maintenance bill for the Lake Powell Pipeline after a few ears? ears on the Lake Powell pipeline. ?